I used Milton’s Multi-Grain English muffins, which I get at Costco. They have more protein and fiber than a traditional one and taste great! Heat a skillet over medium heat, add the oil and peppers, cook until tender. Let cool. Preheat the oven to 350° and spray a 12 count muffin tin with cooking spray. Add about 1 Tablespoon peppers to each muffin tin. Fill up to the top with eggs. Put in the oven and bake for 15 to 30 minutes (mine took 30), until fully baked and the edges are golden brown (check with a toothpick). Split as many English muffins as you desire, butter both pieces and put in the oven for about 3 minutes. (Placed on a cooling rack over a baking sheet works well). Take out and sprinkle cheese on both sides. Put back in for 3 to 5 minutes, until melted. 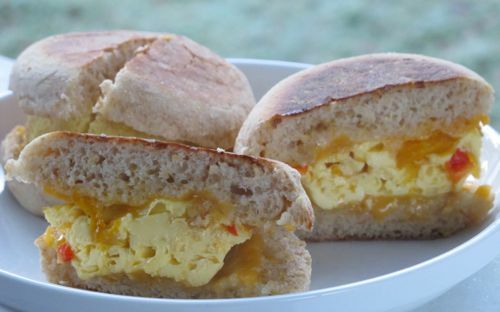 Take out and put an egg muffin on top, top with another half of English muffin. Press down gently and cut in half. Makes 12 total. The eggs store well wrapped up in the refrigerator for easy breakfasts, just assemble when ready to eat. Oh I have to get in the habit of making these again – LOVE!